Some visitors probably expect to see water-lilies and other familiar aquatic plants floating on the pond of the Water Garden. But this water garden has a different focus: wetland plants—in particular, those that have adapted to living at the water’s edge, sometimes called the riparian zone. Riparian plants don’t float on the surface. Instead, they grow along the shore in soil that may fluctuate from dry to waterlogged or even submerged at times. 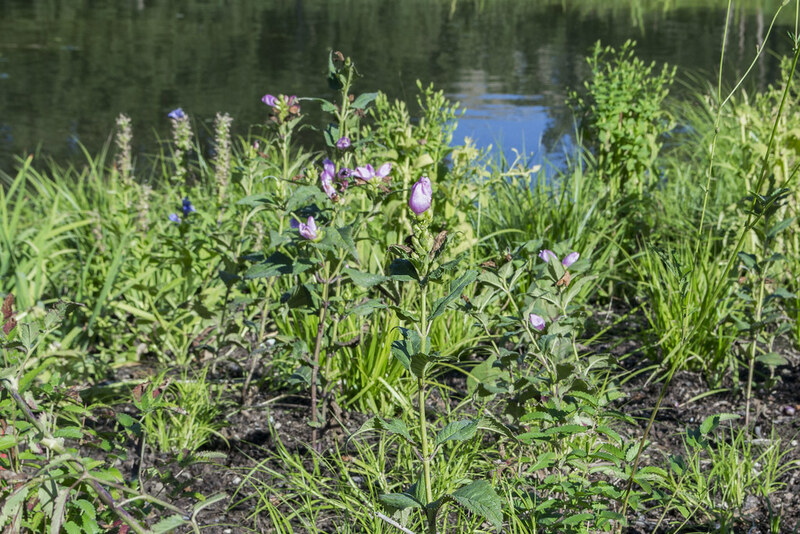 To handle different water levels, these plants have a variety of adaptations. One of the biggest challenges riparian plants must overcome is the lack of oxygen available to their roots in waterlogged soil. Many of these plants have leaves and stems with specialized spongy tissue that allows air to circulate from the submerged roots to the parts of the plants that are above water. The garden was designed to conserve and manage water, and the plants here also serve ecological functions that can contribute to urban sustainability. Many help filter the water and hold the soil in place. So if you look along the edge of the garden’s pond and stream, you’ll see a lush border of riparian plants that are not only lovely to behold but also hard-working and tough. 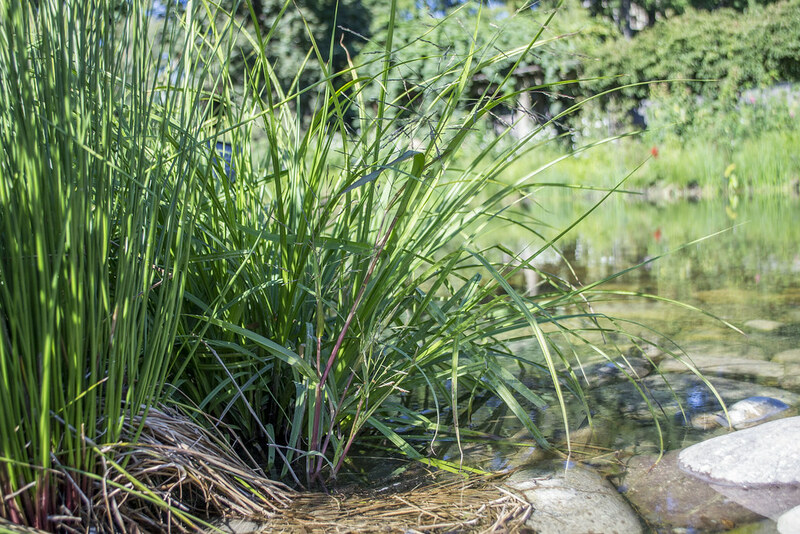 These green plants resemble grasses and don’t mind having “wet feet.” There are a variety of both genuses along the pond and stream here. 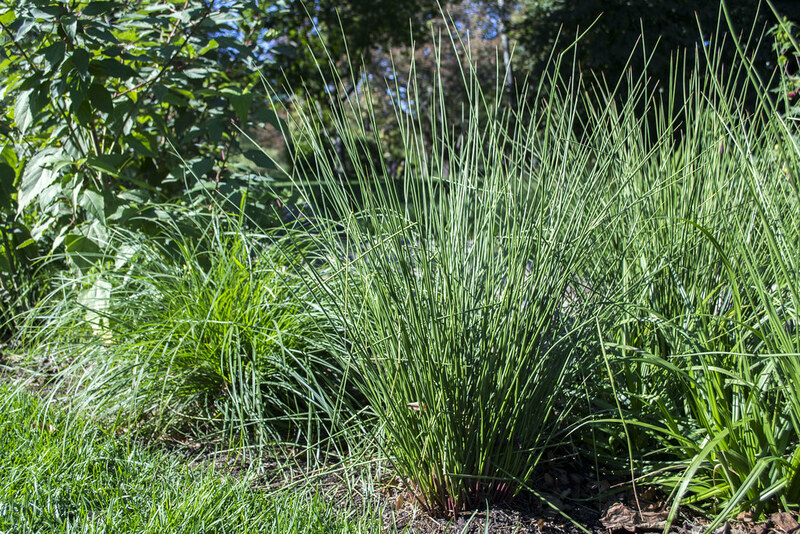 Rushes have round, stiff stems; sedge stems usually have three flat sides. Rushes and sedges help filter the water and provide a lush backdrop for some of the more ornamental flowering plants. This cultivar of an eastern native found along streams and bogs likes saturated soils. The flowers, in bloom now, are thought to look like open-mouthed turtles. 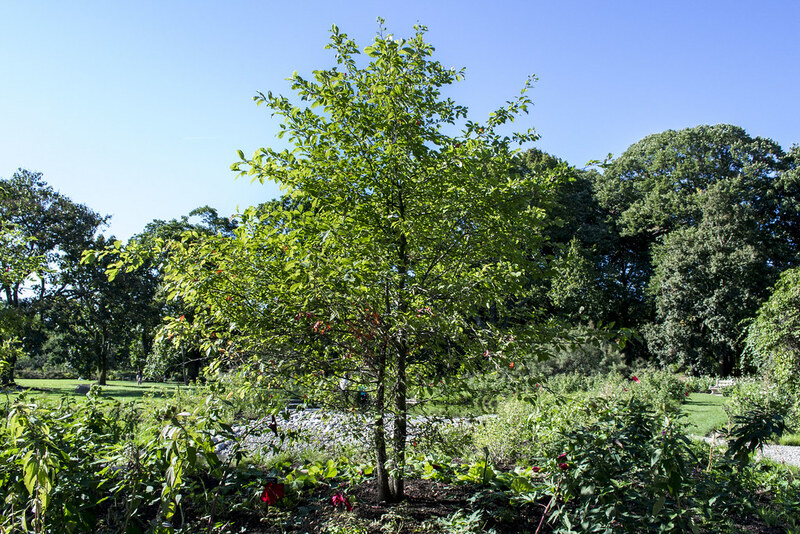 A native tree found in wooded wetland areas, black tupelo can tolerate a wide range of conditions, from standing water to dry, droughty soils. It has beautiful autumn foliage—you can already see some of the leaves starting to turn reddish orange. This wetland plant loves moist soil and shade, and its leaves look like those of a horse chestnut tree. 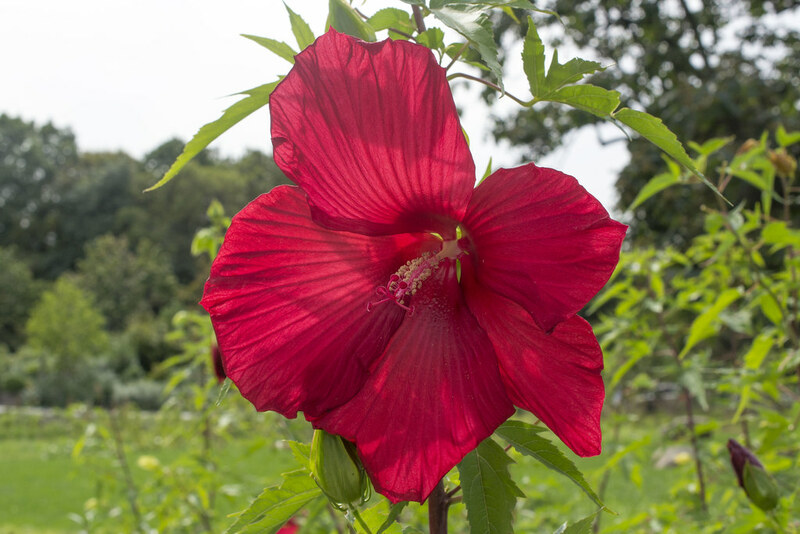 A cross of three native hibiscus species, this big red-flowered shrub also likes to grow in low, wet areas. 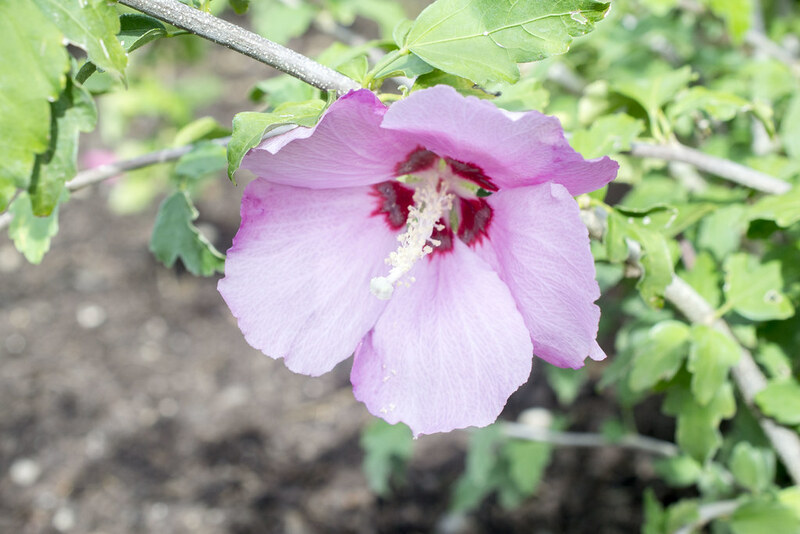 Hardy hibiscus is one of several mallow family members in bloom right now—look for rose-of-Sharon and rose-mallow plants nearby. 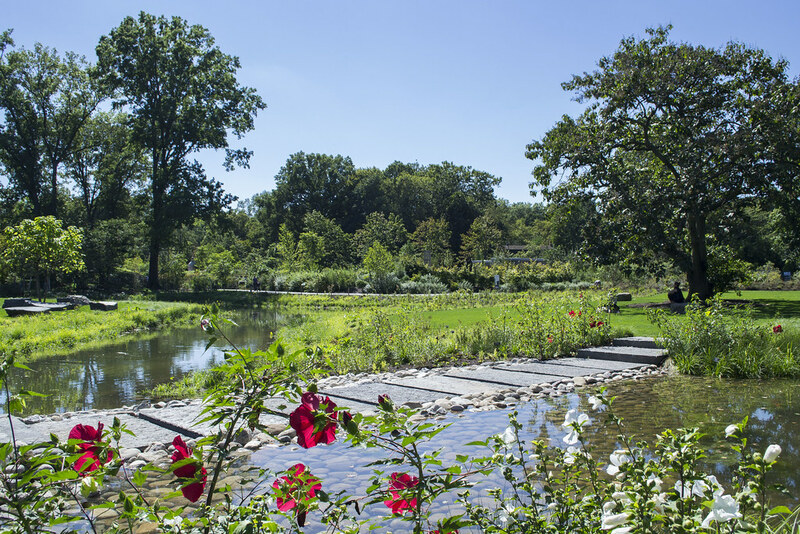 Their presence in the Water Garden compliments the existing mallow collection along the path to the Children’s Garden. Chelone lyonii 'Hot Lips' (pink turtlehead) in the Water Garden. Photo by Alvina Lai. 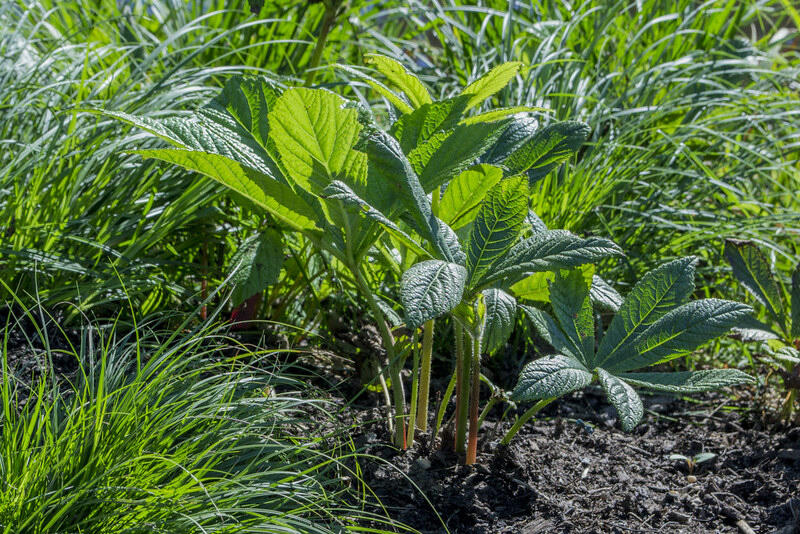 Rodgersia aesculifolia (chestnut-leaved rodgersia) in the Water Garden. Photo by Alvina Lai. Hibiscus 'Lord Baltimore' (hardy hibiscus) in the Water Garden. Photo by Alvina Lai. Hibiscus syriacus 'Aphrodite' (rose-of-Sharon) in the Water Garden. Photo by Alvina Lai. The Shelby White and Leon Levy Water Garden in September. The rock weir helps filter water and regulate pond depth. Photo by Alvina Lai. Juncus effusus (soft rush) in the Water Garden. Photo by Alvina Lai. Carex lupulina (hop sedge) in the Water Garden. Photo by Alvina Lai.